Carhartt Work in Progress (W.I.P. for short) was born out of a desire to keep the Carhartt “brand authentic on both sides of the Atlantic Ocean,” with Carhartt Detroit entrusting Edwin Faeh with a license to produce garments under the W.I.P. moniker. In the years since 1994, Carhartt W.I.P. has grown into a brand of its own, with retailers and flagship stores outside of Europe; from Paris and London to New York and Tokyo, Carhartt W.I.P. is a brand that brings together workwear and streetwear, offering well-made and well-thought product that has endeared it to a rabid following. With a commitment to good product and organic growth, as well as deep roots in the worlds of music, skateboarding and art, Carhartt W.I.P. has grown into a premier collaborator in recent years, partnering with like-minded brands—even ones with aesthetic differences—to create impactful capsule collections that elevate each seasonal offering. From independent artists and retailers, to revered niche brands and high fashion designers, Edwin Faeh’s franchise has mastered the art of the collaboration, meshing the Carhartt W.I.P. workwear DNA with various partners’ distinct styles. These are some of our favorites. Carhartt W.I.P. and Parisian-based A.P.C. came together for supper in 2006, on a cold Swedish night when both brands were opening neighboring stores in Stockholm. Two years later, they started working on a collaborative project that fused the brands’ love of well-made product with their respective aesthetics. The collaboration resulted in four collections, ranging from Fall 2010 to Fall 2013, that were primarily sold through A.P.C. and Carhartt W.I.P. stores; by 2012 and 2013, however, this was expanded, and some select retailers were allowed to carry the collection. Over the years, the collections featured reworked classics from both brands, often in the quintessential fabrics of the other—it was a true collaboration, bringing together the best of both worlds. The byproducts of the partnership are also really easy to spot—thanks to the the use of the Carhartt “Big C” logo in place of the “C” on A.P.C.’s Helvetica brand logo. Among all of the collections, the last offering may have been the best, allowing the two brands to end their partnership on a high note—a rarity in the world of fashion collaborations. For starters, the Fall/Winter 2013 collection incorporated the aforementioned collaborative logo that came to define the project—and gave it an instant visual appeal—in a number of ways, from small tags, to pocket hits, to a large chest print on T-shirts. The outerwear offerings were simple but rugged, a perfect mix of both brands’ DNA, and executed in great, monochromatic colors. Its choices like this—the aesthetic simplicity—that feels natural to a minimalist label like A.P.C. and a utilitarian label like Carhartt. The inclusion of the Commando Sweater for Fall/Winter 2013 also gave the collection a military-meets-menswear angle that was representative of both A.P.C. and Carhartt W.I.P.’s directions at the time. 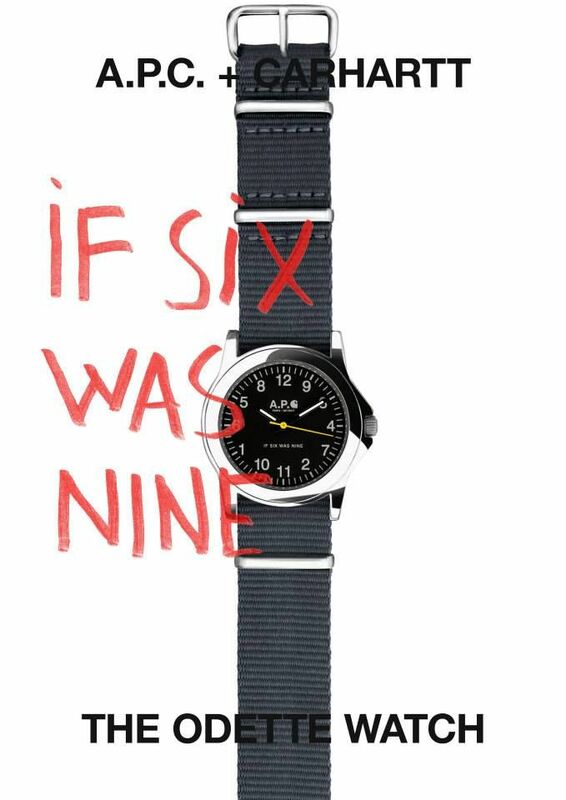 The “If Six Were Nine” Odette Watch, a nod to the great Jimi Hendrix that featured mismatched hours on the dial, rounded out the Fall/Winter 2013 collection with a unique accessory—a must for any memorable Carhartt collaboration (or personal collection). Following up on their immensely successful collaboration with A.P.C., Carhartt W.I.P. turned to Japan’s Neighborhood for a sweeping Fall/Winter 2014 collaborative collection that brought together two brands passionate about workwear and utilitarian clothing. The 24 piece collection was the fruit of a true collaboration between the two brands, with iconic styles from each making their way into the offering. Perhaps the crowning achievement of the collaboration was the incorporation of Neighborhood’s oft-used leopard print on Carhartt’s proprietary Hamilton Brown canvas, reworked to use the natural tan color to inflect the leopard print spots themselves. While it’s definitely a hit-or-miss (depending on your personal taste) the print appeared as contrasting hits on jackets, T-shirts and accessories, but also as the main fabric on some of the jackets. The standout piece was, arguably, the biker jacket. Available in both black and leopard print, the jacket featured a contrast collar and gold hardware, and embodied the union of the two brands’ distinct aesthetics. The collection released at Neighborhood in Japan originally—along with a hyper-limited, Japan-exclusive iPhone case and chore apron—before Carhartt W.I.P. stores and some select retailers followed suit a month later. Much like their collaboration with Neighborhood a year earlier, Carhartt W.I.P.’s collaborative collection with WTAPS, hitting shelves during the Fall/Winter 2015 season, brought together two brands with a shared love of utilitarian-inspired Americana clothing. While considerably smaller than the more robust Neighborhood collection, Carhartt W.I.P.’s collaboration with Tokyo-based WTAPS was equally recognizable and visually striking. Not necessarily known for their graphics at the time, Carhartt W.I.P. provided the canvas for WTAPS’ distinct, simple, typography-laden designs, as WTAPS mastermind Tetsu Nishiyama took some of Carhartt’s most iconic pieces—the Detroit Jacket and Dearborn Vest—and applied blank name tags on the chest, and verbiage on the back of each piece. The pieces were also outfitted with water-resistant treatments, bringing a utilitarian edge to the collection. The jacket retailed for roughly $650, while the vest set fans of both brands back $420 and, while it didn’t sell out immediately at every retailer, each one will still cost you upwards of $400 on the resale market. Carhartt W.I.P. and mastermind JAPAN had teamed up prior to 2013, but the Fall 2013 collection was supposed to be the final instalment of the collaborative project (we’ll get to that in a minute) making it just a bit more special. Like many of Carhartt W.I.P.’s collaborative endeavors, the capsule featured the brand’s staple pieces reimagined by mastermind JAPAN in innovative ways. Aesthetically, the collection stood out thanks to mastermind’s take on Carhartt W.I.P.’s Fair Isle pattern, with the Tokyo-based brand integrating their signature skull and bones logo into the pattern and rendering it in black and white. The pattern was added to garments in the form of inserts on the sleeves and yokes of dress shirts, pants, work jackets, shorts and pocket T-shirts. The collection was released throughout August and September 2013, at Carhartt W.I.P.’s Tokyo outpost, as well as through select retailers and, like almost any mastermind JAPAN project, moved quickly. Produced in limited quantities—and not widely distributed outside of Japan—the pieces are insanely hard to come by today, making it one of the more mysterious Carhartt W.I.P. collaborations to date. While the Fall/Winter 2013 collection was supposed to put the Carhartt W.I.P. x mastermind collaboration to bed, Edwin Faeh turned to some friends to help mark the opening of a new Carhartt W.I.P. retail store in the Ikebukuro district of Tokyo. The two brands released a co-branded T-shirt, exclusively available at the store’s grand opening. Due to the limited quantities produced, and the insanely high demand for the T-shirt, Carhartt W.I.P. had to resort to a lottery system, with winners allowed to purchase one T-shirt and only in their pre-entered size. According to some, it was the most limited Carhartt W.I.P. collaboration yet. Junya Watanabe, the legendary Japanese designer whose eponymous line lives under the Comme des Garçons umbrella, had previously collaborated with the Detroit-based arm of Carhartt. Even still, Watanabe has recently sparked a relationship with Edwin Faeh’s European offshoot. When Watanabe debuted his Spring/Summer 18 collection on the Parisian runway, it wasn’t necessarily a surprise to see Carhartt W.I.P. among the seasonal collaborators, given their previous work together for Fall/Winter 2017. The Spring/Summer 2018 capsule offered a wide range of classic Carhartt silhouettes —reimagined through Watanabe’s eyes—including an examination of (or, obsession with, depending on how you look at it) the brand’s classic Hamilton Brown canvas. In total, the Spring/Summer 2018 edition of the Carhartt W.I.P. x Junya Watanabe MAN collaboration featured a whopping 48 pieces. The collection’s standout piece, duck canvas ruminations aside, is clearly the all-over paint-splattered workwear jackets that reflects Watanabe’s vision for how workwear should be worn. Clearly replicating the jacket’s appearance after a hard day working, the piece represents a collection that focuses “legit way to wear workwear”, as Watanabe explained in own words. In case you hadn’t noticed, there’s a trend when it comes to Carhartt W.I.P.’s collaborative partners: They tend to team up with brands hailing from Japan. The 2006 capsule with BAPE certainly set the bar high for those that would follow in Nigo’s collaborative footsteps. Featuring hoodies, coach jackets, parkas, caps and vests, the collaboration was stretched over a few seasons. Classic silhouettes like the Car-Lux vest, Siberian Parka, and Active Jacket were dipped in BAPE’s iconic camouflage pattern from 1995. By no means was Carhartt an unknown brand in 2006, but Carhartt W.I.P. was still relatively new and the collaboration with BAPE elevated it to a new level of legitimacy within the high street realm, with the likes of Takashi Murakami being photographed wearing pieces. A high-profile collaboration like this would have dominated the internet in today’s day and age, but was reserved for those in the know in 2006, making pieces even harder to come by today as those who originally bought them are probably still wearing them. Carhartt W.I.P. has a long-standing retail relationship with Italian retailer Slam Jam that includes a set of collaborative releases. The Spring 2015 collaboration was wide-ranging—counting 25 pieces and five “themes”—and strikingly clever. “Denim” and “Putty”-themed capsules gave way to one drawing inspiration from workwear’s penchant for safety, with a “Reflective” collection dropping in April 2015. Released alongside black takes on the same pieces, the white-on-white T-shirt, jacket, hoodie and vest were a playful take on safety-conscious workwear, outfitted with strips of reflective tape hidden in plain sight. It was an apt way to merge form and function, highlighting the silhouettes by opting for a simple all-white color palette, while also paying homage to Carhartt’s workwear roots. The white-on-white pieces would probably go unnoticed from far, by even the most fervent Carhartt fans, but they still rank among the sought after pieces in the brand’s insanely deep archives. Considering that Slam Jam has been a consistent stockist of the European “designer” wing of Carhartt for year, it makes sense that they’d be the ones to know how to work with the workwear brand on a highly-desirable collection. Edwin Faeh’s Carhartt W.I.P. has always had strong ties to the music scene in Europe, something which helped not only shape the face of the Carhartt brand overseas, but also grow its popularity. In 2014, Carhartt W.I.P. turned to the home of its parent brand, Detroit, Michigan, to unearth one of its musical collaborators: Danny Brown. With the help of Dr. Romanelli, Carhartt W.I.P. crafted a series of remixed garments for Danny Brown to wear on his European Tour. Mixing materials, colors, camouflages and the aesthetics of different Carhartt pieces, the result was unlike anything Carhartt W.I.P. had done before. In retrospect, it was prelude of sorts to future mixed-media collaborations with Junya Watanabe. Like much of Dr. Romanelli’s work, the pieces were designed purely for marketing—made to measure for Danny Brown—and are veritable works of art, as opposed to mass-produced garments. That makes them exceedingly heard to come by, true collectors’ items and— arguably—the ultimate grail for a Carhartt W.I.P. fanatic. If you’re well-versed in Carhartt WIP’s history, you know that its roots lie at the intersection of culture and skateboarding in Europe. It was only natural, then, for Carhartt to join forces with PACCBET for a Spring/Summer 2018 capsule collection that was heavily influenced by the skateboard scene in the former Soviet Union. PACCBET is the brainchild of Gosha Rubchinskiy and Tolia Titaev and has grown to become one of the preeminent skate-inspired brands in all of Europe, let alone Eastern Europe. The 12-piece collection studied Carhartt W.I.P.’s early history. Rubchinskiy and Titaev brought some of the brand’s most iconic styles out of the archives and reverted to baggier cuts on everything from T-shirts to jackets to pants. The inclusion of a patchwork Master Pant, with one black leg and one white leg, reinforced the second-hand aesthetic that the two brands appear to have been aiming for. The use of Carhartt W.I.P.’s logotype to write PACCBET across garments made for an instantly enticing collection, but the co-branding gave the collection an authentic aura of Carhartt gear that had been bootlegged by a smaller skate brand. The appeal of the collection lies in that authenticity—even the faded denim of the overall is emblematic of ’90s denim. The collection’s garments feel drawn straight from Rubchinskiy and Titaev’s archives, as if they had simply silk screened PACCBET on their old clothes. It represents what Carhartt W.I.P. is really about and sheds light on how it was worn in its early days—especially in the context of skateboarding. We are unabashed fans of seemingly random collaborations—things you would never even think of, but when you see them you can’t help but think, “Yeah, that’s cool.” Carhartt W.I.P. has developed a reputation for eccentric and off-kilter accessories over the years, from camping BBQs to Bialetti espresso makers. So, when Carhartt W.I.P. announced a trio of jiu-jitsu uniforms in collaboration with Hyperfly, we were excited but not surprised. The launch of the uniforms —in three iconic Carhartt colours, black, navy and Hamilton brown— coincided with a Carhartt W.I.P. pop up in Japan. It was the type of thing that only W.I.P. could execute with such tact (though Undefeated would likely beg to differ with that statement). Ultimately, you’ll rarely, if ever, see the entire uniform worn together, but the more confident among us might be able to work either the pants or top into our outfits. If anything, it will still rank among the more collectible collaborations in W.I.P.’s archives. Patta opened its doors in 2004 and quickly established itself as one of Europe’s most influential streetwear players. The Amsterdam-based boutique celebrated its first decade of business in 2014 with a host of collaborations, that included, among others, the iconic “Wild at Hartt” capsule. Patta and Carhartt W.I.P. have always seemed like natural partners: both have genuine ties to underground music and graffiti, while playing an influential role in how actors in those scenes dressed. The small Fall/Winter 2014 capsule was, per Patta, an ode to the mutual respect between the two brands. The collection is mostly remembered for the Car-Lux vest, emblazoned with “Wild at Hartt” on the back. Perhaps most importantly, the 2014 collection solidified the bond between Patta and Carhartt W.I.P. and sewed the seeds for a perfectly timed 2016 collection. The 2016 capsule infused Patta’s sportier side into Carhartt W.I.P. classics. The massive collection included revisited pieces from the W.I.P. archives and brought some of the brand’s lesser known athleisure pieces back to the fore. The Nimbus pullover and Madison jogger pant typified the late-’90s style the two brands were going for and the collection set the tone for the tracksuit craze that would sweep through streetwear and fashion in 2017.